This morning it was again very cool, perhaps 2°C. 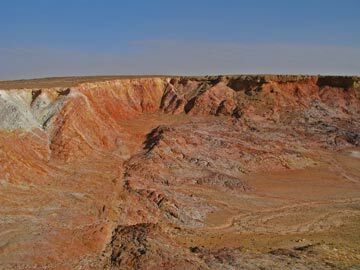 After a walk around the camping area, we leave and drive 12 kilometres to south to a series of mound springs located just off the Oodnadatta Track. 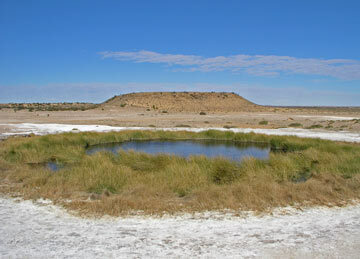 The first mound spring is called Blanche Cup (which is a cool pool) and then the Bubbler. This had water bubbling to the top and then flowing down the hill. It was very warm, perhaps 35°C. A couple of kilometres after getting back on the Oodnadatta Track we come across a HQ Holden stuck on the side of the road. They have pulled a little off the road and got bogged in the soft sand. They are Germans and have been trying for quite some time to get the car rolling again. One of our people jumps in the car and within 15 seconds has it back on the road. All they had to do was drive straight ahead and get up some speed before turning back on to the road. Easy. They were trying to turn without first getting some forward momentum. 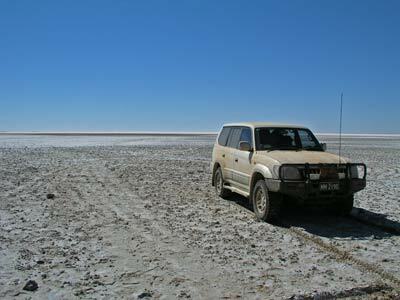 This reminds us of an Austrian couple who got bogged at Lake Eyre, north of William Creek, in December 1998. Their Toyota LandCruiser got bogged and they could not free it. 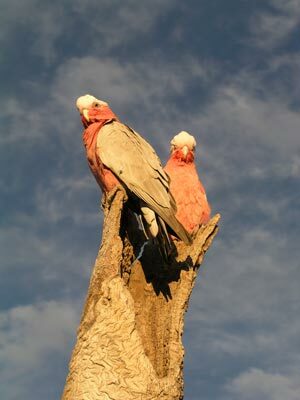 They set out and tried to walk back to William Creek but the male became ill. He returned to the car while the female Gabriele Grossmueller, aged 28 years, continued on. She died on or about 12 December, 1998 of heat exhaustion. He survived when found by the Police on about 15 December. The Police were able to extract the car by dropping the air pressures in the tyres and a small amount of digging. See the Coroner's Finding for more details. Once they head off we continue along the track and about 20 kilometres on we stop at Margaret River where we have morning tea. After morning tea it is only a few kilometres to Curdimurka Siding (GPS S29° 28 36.5 E137° 05 06.0 using WGS84) where there are 4 kilometres of track, a fairly good rail building and water tower and desalinator. 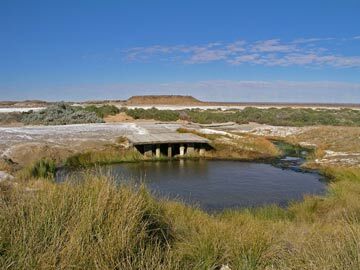 To the west there is a long bridge, the second longest in the state, over a creek that leads into Lake Eyre. The bridge and buildings make great photographs. There used to be a bi-annual ball held here but I do not think it is held anymore. From Curdimurka it is only 8.5 kilometres to the normal access point to Lake Eyre South (GPS S29° 28 31.7 E137° 10 25.3 using WGS84). When the lake is dry (as it is most of the time), you can drive down onto the lake bed. You can go out a fair way but personally I would not go to far in case the salt crust is thin and you drop through into briny water. When you get on the lake, have a look at the GPS in you car and you will notice that the altitude is probably about - 10 metres. This is the lowest spot in Australia. 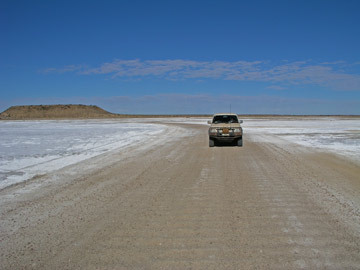 After some time on the salt pan, we head to Marree. The wind is now blowing gale force, perhaps 90 kmh. It is a bit unpleasant outside as the sand is blowing all over the place. 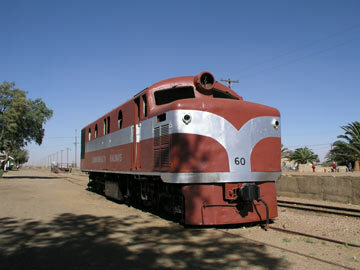 When we get to Marree we have a look at the railway engine, station and other Ghan artefacts. We also look at Tom Kruze's truck. 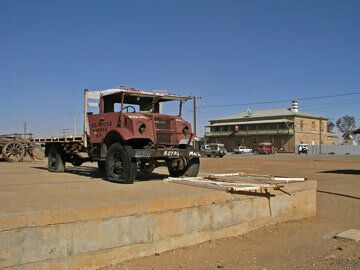 This was used by him back in the 1950s and later to run mail and other things to Birdsville along the Birdsville Track (back when it was a lot worse than it is now). We have lunch in the pub, they have very nice pies ($3) and chips ($4). We refuelled up the road and I purchased a very nice shirt from the pub ($28). Our plan was to then go to Farina and camp there but the wind had not dropped. This is an old deserted town, with dozens of streets and lots of deserted and destroyed buildings. It would have been interesting to stay but the wind was still the same and dust blowing everywhere. We decide to go onto Lyndhurst. We stopped at the Ochre Cliffs (pit). This is very interesting, orange, yellow, white, red, purple and other colour ochres. It was apparently used by Aboriginals from all over South Australia who would either come here or trade with others who visited so that they would have ochre for ceremonies. 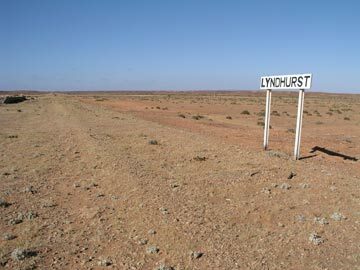 We arrive at Lyndhurst, a very small town at the intersection with the Strzelecki Track. 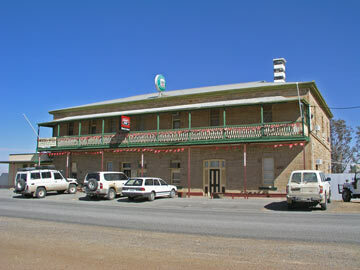 The camping ground is on the exposed side of the Lyndhurst Elsewhere Hotel, so it is a bit pointless to stay there. We decide to spend the night in a room attached to the pub. It cost a donation to the Royal Flying Doctor Service. We have dinner at the pub, $11 for chicken snitzel and $4 a Pale Ale. We have quite a few beers as it is not too nice outside and the room is not the greatest (but better than camping). A nice night. Temperature today was about 26C. The wind has dropped heaps from last night but while it is still windy, it is not too bad a day. 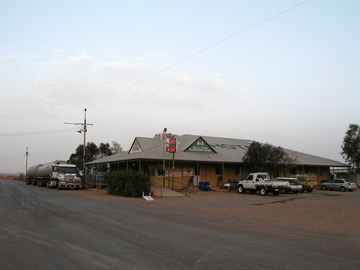 We drive out to Talc Alf's Art Gallery which is right next to the Ghan Railway line and (I think) the location of the old Lyndhurst Railway Station. What a weird bloke! He has all these items carved from talc (which is what talcum or baby powder is made from). If you ask him a question he has this roundabout way of answering that always seems to come back to the same outcome (which as I write this four years later I cannot remember). Worth a visit as he is very entertaining. I purchase a republican flag he had designed. He also told us he had changed "Public Toilets" in town to RePublic Toilets. After our entertainment, we head on up the Strzelecki Track towards Innamincka. We are only going as far as Merti Merti Station where we head back across to Cameron Corner again. We have morning tea at a creek and then have lunch at MacDonells Creek which is next to the homestead formerly called Mount Hopeless and then later called Blanchewater. 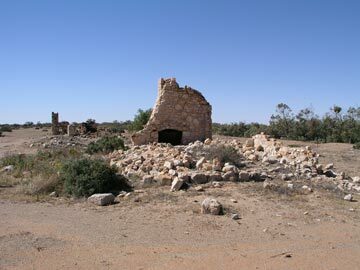 This is where Burke and Wills were trying to get to when they died as it was then the northern most property in South Australia. The whole of this track is quite boring and is not worth doing again. Closer to Merti Merti there are lots of kites circling over the sand dunes, hundreds in some spots. I later ask Jeff Hardy, a noted ornithologist employed by NSW National Parks and Wildlife Service about this and he says they were probably after grasshoppers. We then go to Monte Collina waterhole where originally plan to stop for the night. However, this is a very poor as a camp site so we think that the Strzelecki Crossing Camp Site might be good but we miss the actual turn-off to the site. By the time we realise this we are too far along to go back. We then decide to go on to Merti Merti Station. We camp east of the homestead at GPS S28° 36 40.6 E140° 16 50.3 using WGS84 as datum. This is a nice spot just off the Old Strzelecki Track (which we had travelled on three weeks ago). It is still very windy but it dies at dusk. We have a great campfire as there is lots of small timber on the ground. Frank and I have a roast beef and veggies dinner, it takes 30 minutes to cook.